To be or not to be ….a Bazaar Star? 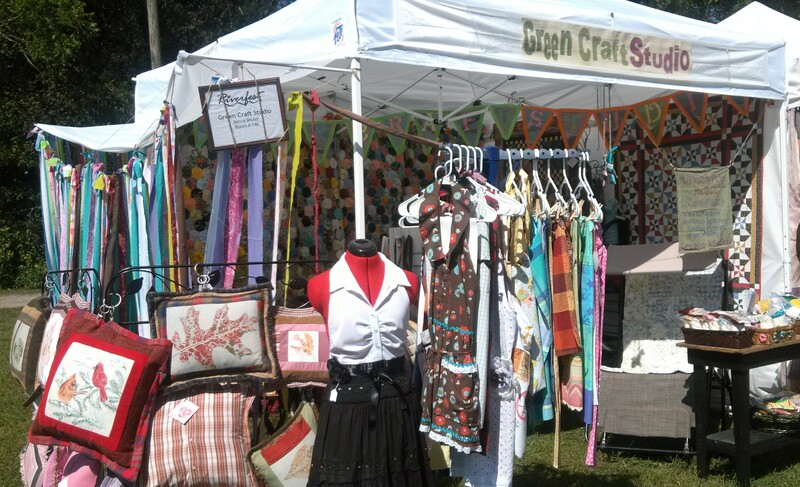 In my life I have only participated in two craft festivals from behind the counter—once as an assistant to a friend who makes jewelry and once as owner of Green Craft Studio. There is a big difference between assisting and doing the show. The preparatory work alone makes me shudder to consider. There are so many thoughts to process….what NEW items to produce…and how much stock to prepare…and the pricing and tagging….and the signage…. the TO DO LIST grows and grows …and suddenly, it’s SHOWTIME! Which translates: SMILE, SMILE, SMILE until your face hurts. That’s my plan for success during my next show anyways. Appealing to the masses can be a looming task for any artist, but especially one who designs and creates products one at a time like I do. I take cues on what to produce from my custom requests filtering into the studio through my online etsy shop: https://www.etsy.com/shop/greencraftstudio. As I attempt to fill the booth with complimentary items, I envision a Shabby Country Cottage Chic arrangement in shades of the season. You will see vintage inspired handmade bags and aprons among other vintage or vintage inspired accessories for the lady(s) in your life. Everything in the booth is handmade. And whether its my line of Ruffled Flapper Totes in 3 sizes or Retro Kitcheyware Aprons for guys and gals, the booth is sure to be filled with a feast for your eyes. Don’t be surprised if you feel nostalgic as you stroll through, browsing until your hearts content, after all everything from the studio is taken from the past. They all lived as something else prior to becoming a product of the Green Craft Studio because the materials are re-purposed clothing or linens. The prices are very affordable, but the quality is superb. I know you will go home with something you just love! I also know that as long as I can SMILE, I can get through the craft show with success. Greeting everyone who walks by the booth might be a bit over the top, but I hope to meet as many new folks as possible. If you get to come to the mountains of North Georgia this autumn, be sure to plan time for the Mountain Moonshine Festival in Dawsonville, Georgia and look for us. Stop by and register for a chance to win a holiday shopping coupon card, so you can shop LOCAL online w/ me and my fellow Etsyians. This blog will be updated as the dates for the Mountain Moonshine Festival draw near. Mark your 2014 calendar: Sat/Sun, Oct. 25, 26 in Dawsonville, Georgia. Thanks for reading my bazaar star blog. Return for more …new blogs weekly.